Whenever Ling Tong loses equipment, he can attack anyone or damage someone within range. Ling Tong cannot simply choose to discard an equipped card to activate "Whirlwind." He must either have another character forcibly remove it from his equipment area or he must replace it with another piece of equipment. When using option one from "Whirlwind," Ling Tong does not need to play an Attack card. He simply chooses any character and they are Attacked by him. If Ling Tong activates option one from "Whirlwind" during his turn, this Attack does not apply to the rule that states that a character can only use one Attack per turn. In other words, Ling Tong can Attack anyone with this power and use an Attack of his own. If Ling Tong activates "Whirlwind" by replacing equipment, the ability takes place after the original piece of equipment is discarded and before the new piece of equipment is placed in his equipment area. For example, if Ling Tong replaces one -1 horse with another and activates option two of "Whirlwind," he has no -1 horse for the calculation of his physical range an can only cause damage to neighbors without a +1 horse. If Ling Tong plays a Wine during his turn then activates option 1 of "Whirlwind," the target is considered to have been Attacked with Wine. If Ling Tong uses option one of "Whirlwind," he can use the weapon effect of whatever weapon he has equipped during that time. However, if he is replacing one weapon with another, remember that the power goes into effect before the new weapon is equipped and after the old weapon is discarded. In this situation, Ling Tong has no weapon when the power goes into effect and hence cannot use a weapon effect with the Attack. When Ling Tong activates option one of "Whirlwind," the Attack that is produced is a colorless Attack without any elemental attributes (unless Ling Tong has the Fire Fan equipped and chooses to use its weapon ability). "Whirlwind" is a power that activates on a 'per-instance' basis and not a 'per-piece' basis. If Ling Tong loses multiple pieces of equipment in one instance (such as when Wu Guo Tai uses "Exposure"), he can only activate this ability once. If another character activates the weapon effect of the Ice Blade and discards two pieces of equipment on Ling Tong, Ling Tong can activate "Whirlwind" two times, as the two pieces of equipment are removed one at a time. When Ling Tong is able to readily replace his equipment, he is very powerful. "Whirlwind" gives him two solid options for dealing with his enemies. "Whirlwind" can also be viewed as a defensive ability, as enemy characters will be less likely to discard Ling Tong's equipment if they are putting themselves or their allies at risk. Option two of "Whirlwind" is helpful in bypassing defensive character abilities such as Zhuge Liang's "Empty City," Zhen Ji's "Overturned Country," and Zhang Jiao's "Lightning Strike." Remember that option two is not an Attack and it simply deals damage that cannot be avoided with the use of an Escape. "Whirlwind" is more difficult to activate than one would initially think. Not only does Ling Tong need to acquire a piece of equipment, but he must also find a way to discard it from his equipment area. This is often easier said than done. In order to be very effective, Ling Tong needs to have teammates that can easily give him equipment. Since the player choosing Ling Tong is unable to communicate his character choice to his allies when his they are choosing their own characters, there is no way for him to ensure that he will have the right team to help him activate "Whirlwind" on a consistent basis. Xun Yu/Guo Jia/Liu Bei/Xu Shu - These characters can give Ling Tong cards with their abilities. This helps him find pieces of equipment that can be used to activate "Whirlwind." Guo Jia and Liu Bei are better than the other two when paired with Ling Tong since they know what cards they are giving him and the can ensure that they are giving him equipment, but Xun Yu and Xu Shu are still very helpful. Wu Guo Tai - Wu Guo Tai can use "Exposure" to force Ling Tong to swap his equipment with another character. Realize that Ling Tong can only activate "Whirlwind" once per use of "Exposure" no matter how many pieces of equipment are swapped, but the fact that he can use this power on a consistent basis with the help of Wu Guo Tai is not something to be overlooked. Zhang Zhao & Zhang Hong/Chen Gong/Zhang He - These characters have abilities that allow them to give other characters equipment. This can be very helpful for Ling Tong. 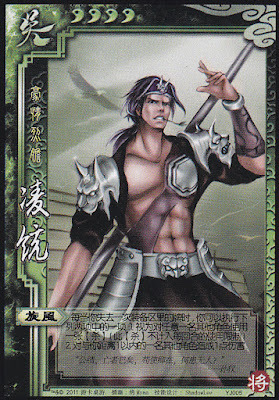 Sun Jian/Sun Ce/Gan Ning/Jiang Wei - These characters have abilities that can force characters to discard cards. Sun Jian and Sun Ce's "Brave Spirit" allow Ling Tong to choose which cards he discards, and he can choose to discard equipment to activate "Whirlwind." Gan Ning's "Surprise" and Jiang Wei's "Instigate" can be used by them to forcibly discard Ling Tong's weapons to also activate "Whirlwind." Sima Yi/Xiahou Dun/Fa Zheng - These characters have retaliatory abilities that would activate each time that Ling Tong damages them with "Whirlwind." They can give him problems if he chooses to target them with his ability. King Ling Tong is not a good king choice. "Whirlwind" is a not a power that allows him to keep himself alive for a long period of time. Loyalist Ling Tong is a competent loyalist. "Whirlwind" can be used to damage rebels. Rebel Ling Tong is probably best as a rebel. Option one of "Whirlwind" allows him to Attack the king from any distance, and option two is even better if the king is within his physical range. Spy Ling Tong is a poor spy pick. Ling Tong really needs a team in order to activate "Whirlwind" frequently. Once it is revealed that Ling Tong is the spy, other characters will probably be reluctant to go out of their way to help him to activate his ability if they are unsure of who he will target. It can be quite frustrating to use Ling Tong without the help of a capable team. If Ling Tong is on his own, he is probably one of the weaker characters. Unlike Sun Shang Xiang, his ability does not have the potential to self-perpetuate. However, with a team with allies listed in the 'Notable Combinations' section, he can be a force to be reckoned with. Always acquire equipment at every possible opportunity with Steals and Harvests.